Life is good when your dreams come true. 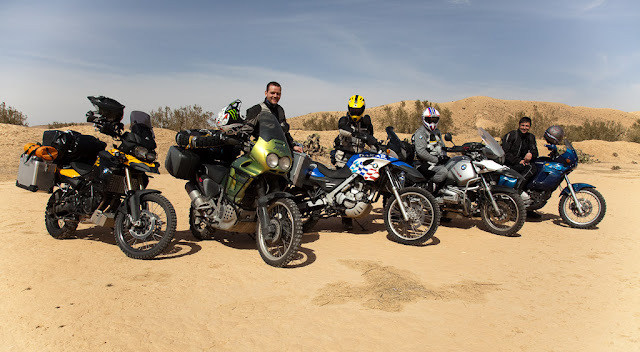 One of mine is to ride the bike down through the Africa... To be closer to that dream i always wanted to try to visit at least either Tunisia or other north african country to test my skills in driving in desert. This winter I found some guys on the Internet who had the plan I could join. 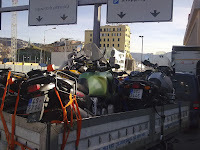 Ten days of holiday, one week in Tunisia on motorbikes sounds good enough for a winter vacation. We took a van with trailer to get us to Genoa in Italy and then moved with ferry to Tunisia. Old ferry sails about 24hours and complicated process at the port on the other side adds couple of hours to it. Then it was still a long way to the desert. 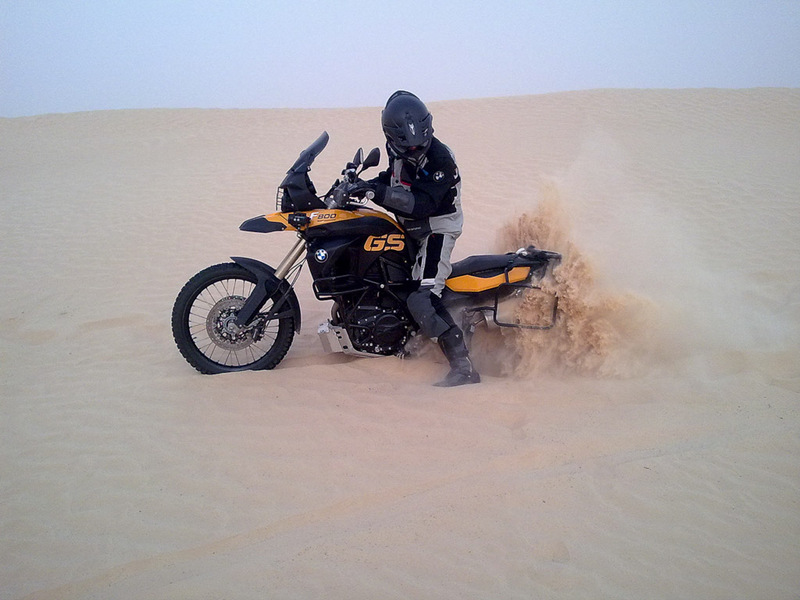 You have to ride another 500km to be closer to Sahara. Touzer welcomed us with first touches of sandy roads and we did first off-road to see old star wars city from the time when George Lucas was filming his famous movie. Then we moved across huge salty lake without any watter (picture bellow) to Douz which is known as Gate to the Sahara. The adventure we're here for is to cross 110km of the desert to Ksah Gilane which is Oasis of original inhabitants - Berber's. Start was complicated due to issue with Patrik's Cagiva Elephant. We were crazy enough to continue after this first warning. But we didn't know what is Sahara about, yet! There was no marked road on the begining. Small dunes gave us a hard time but we made it to the sandy road. 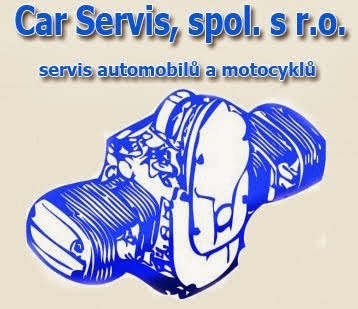 It was the best off-road I have done so far. Hard ground covered with 20cm of smooth sand. Once upon 30km there was a Berber's buffet in the middle of nowhere and they served only a cay and coke which you can find anywhere in the world! 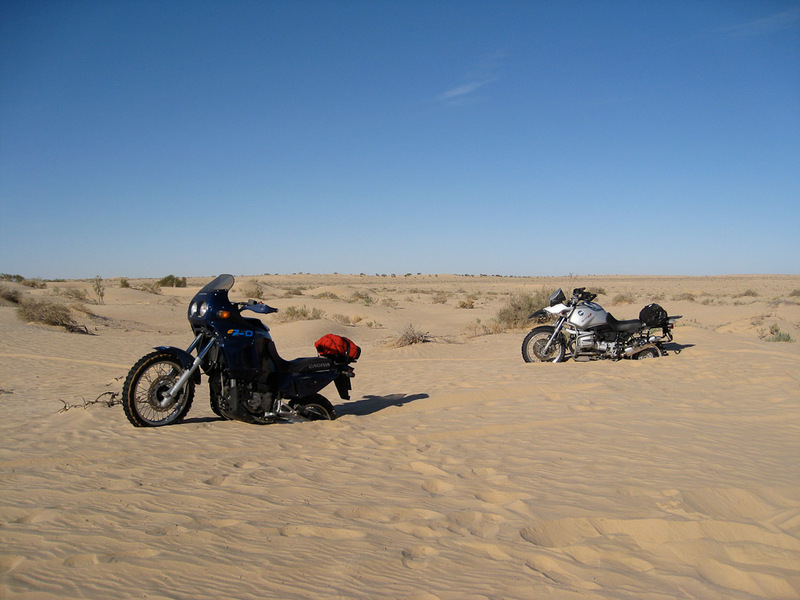 It wasn't easy to navigate as there is no landmarks which you can use as reference point. Only thing which keeps you on the track is your GPS. But nothing what you can relly on as the tracks moves every day with the sand moved by wind which is allways present here. 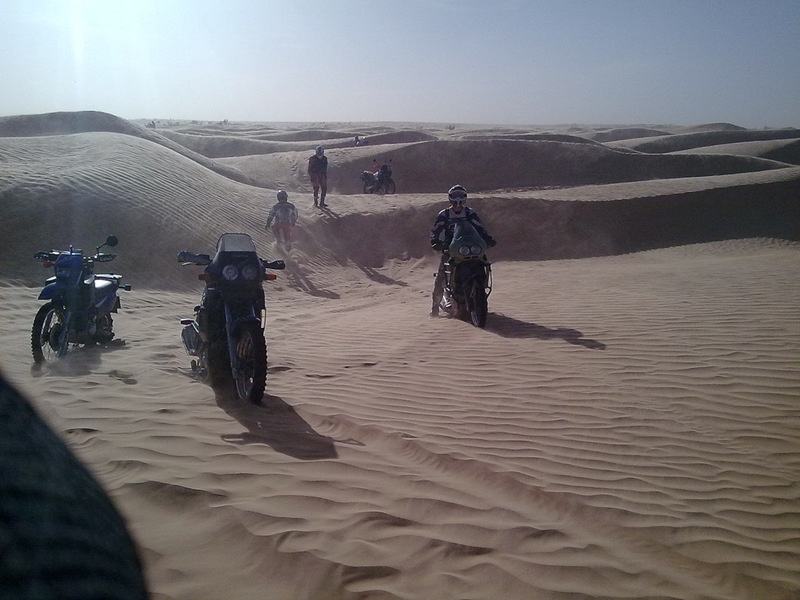 It was still about 30km to go when we reached real Dunes. Until now everything seemed possible but what lied ahead was stunning. Land full of waves like the sea but instead of watter it was filled with the mildest sand similar to dust. Following hundreds of meters were disaster! We were moving meter by meter slowly moving forward. Nobody had experience to be prepared for this. 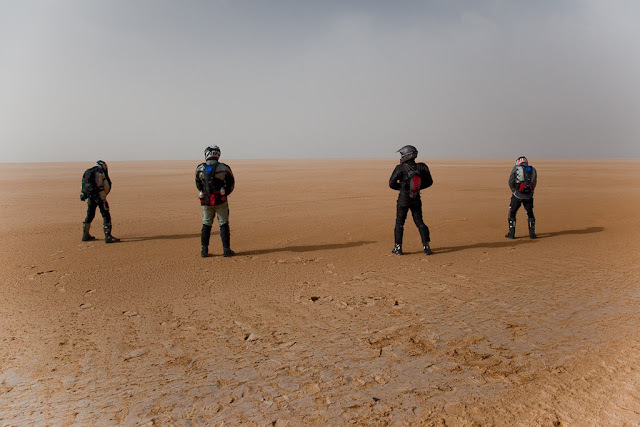 Heavy bikes became stones in our pockets while crawling the sea of sand. It took us about 3hours to do only 2 kilometers and we were all exhausted and running out of watter. We started to panic a bit and seek a place to sleep when we've seen that the time is running so fast and we're still not on the right track.